ABU DHABI: India's Prime Minister Narendra Modi has been given the United Arab Emirate's highest civilian award, Zayed Medal, for his efforts to strengthen the relations between the two countries. 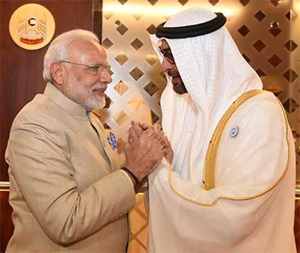 The Crown Prince of Abu Dhabi, Mohamed bin Zayed Al Nahyan, said in a tweet, "We have historical and comprehensive strategic ties with India, reinforced by the pivotal role of my dear friend, Prime Minister Narendra Modi, who gave these relations a big boost. In appreciation of his efforts, the UAE President grants him the Zayed Medal." Modi tweeted to say he accepts the award with "utmost humility". "I accept this honour with utmost humility. Under your visionary leadership, our strategic ties have reached new heights. This friendship is contributing to the peace and prosperity of our people and planet." The crown prince had played a role in February last to deescalate the tension between India and Pakistan following the Pulwama terror attack. An External Affairs Ministry spokesperson said India "greatly" appreciated this honour conferred on PM Modi. "This singular honour is in recognition of the efforts of the government under the Prime Minister's leadership to develop the strategic partnership between India and the UAE." The previous recipients of Zayed Medal are Russian President Vladimir Putin, former US president George W Bush, former France president Nicolas Sarkozy, German Chancellor Angela Merkel, Queen Elizabeth II of the United Kingdom and Chinese President Xi Jinping.